Kentucky-Fried memories, tributes and condolences poured out from Yellowknifers after Monday's announcement that the city's only KFC outlet would be closing after 47 years. Long-time franchise owners, the Jason family, say they will be closing the popular restaurant on Aug. 23, after years of frustrations with corporate headquarters. The Jason family say they were neglected by KFC. Kentucky Fried Chicken was the first fast food chain to arrive in Yellowknife, opening in 1968, which might help explain its immense popularity both with locals and across the Northwest Territories. Yellowknife didn't get a McDonalds franchise until the 1990s, a couple of years after Moscow got one. Matthew Jason, one of the family members who runs the restaurant, said the Yellowknife location was consistently ranked in the top 10 best performing KFC franchises in Canada. The closure took many by surprise Monday afternoon, with most professing their sadness. People shared emotional stories using the Twitter hashtag #RIPKFC. 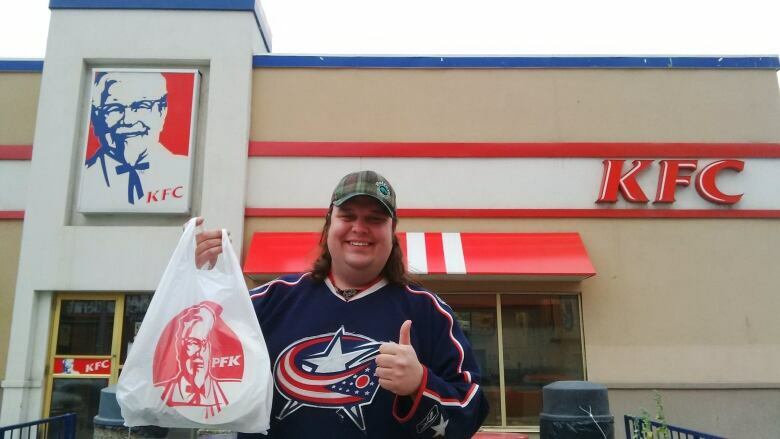 Big KFC fan and Buffalo Airways general manager Mikey McBryan says when he heard the news the restaurant would close next month, he rushed down and got himself a chicken dinner. He says it is a staple of northern life. "It's part of the heritage now and that seems really weird to say that an American chain food from Kentucky is part of northern heritage but it's been around coming on 48 years," he said. "Chicken is older than diamonds. Chicken is from the '60s, diamonds they just found in the '90s." He says KFC is often the culprit when people are late to their flight. "People will call [the airline] ahead being late and they're like 'I'm rushing, as fast as I can.' And what do they show up with? A handful of KFC." That smell has gotten to many pilots. McBryan says his dad Joe makes people wrap up their KFC in garbage bags. If you were in the north and online, it was impossible to avoid the news of KFC's closure. By Tuesday evening, CBC North's initial article on the closing had already been shared almost 2000 times. Many weighed in on the fact their social media feeds, like their arteries, were being clogged by the Colonel. Right now, <a href="https://twitter.com/hashtag/Yellowknife?src=hash">#Yellowknife</a> is imploding with the news that the local <a href="https://twitter.com/kfc_canada">@kfc_canada</a> branch is shutting down. So many broken hearts. ​KFC's been a Yellowknife dining mainstay for so long, others wondered what they would do without buckets of chicken. The Jason family says it plans to renovate the space and open up a restaurant called Lenny Burger, named after their father, who used to own the franchise. Some wondered what they would do in the meantime. CBC North received dozens of emails, reminiscing about past KFC memories. Thomsen D'Hont wrote about the time he was leading a kids day camp at Long Lake beach and they stumbled upon a massive vat of KFC, which he figures had more than 1,000 pieces of chicken in it. "I peered over the edge of the box into a heap of gleaming, golden chicken pieces sweating in the midday sun... My whole life I have had this odd reaction to fat and salt that brings me into a euphoric, trance-like state, not unlike mild alcohol intoxication," he wrote in an email. "The events of the day were extraordinary." Isla Noel sent an email about her time in Fort Smith in the '70s, when an airport employee named Dwight would take KFC orders. He would make arrangements for an envelope with cash to be handed to the PWA flight attendants and taken to Yellowknife. "[There] the person from KFC [was] waiting at the airport with dozens of individually packaged orders of piping hot, freshly made chicken, gravy and fries and [the flight attendants would] hand them the envelope with cash," Noel said in an email. Once back in Fort Smith, the airport employee Dwight would deliver the still-hot KFC. Former Yellowknife Mountie Ron Near wrote about a thief who used to break into the KFC. When the RCMP couldn't catch him, former owner Len Jason took it into his own hands. "He hid in the store with a baseball bat for a couple of nights with no success but then the culprit returned," Near wrote. "Len waited until he got fully inside and up to the till before jumping from the shadows. One swing of the bat and a direct hit to the guy's kneecap was all it took." Matthew Jason, one of the current operators, says it was actually his grandfather, Jarvis Jason, who hid in the store for "weeks." He says the judge ended up letting the thief off, saying that he received a severe enough punishment in the beating. Keep them coming... we're still collecting your favourite KFC memories. Please share yours with haydn.watters@cbc.ca.